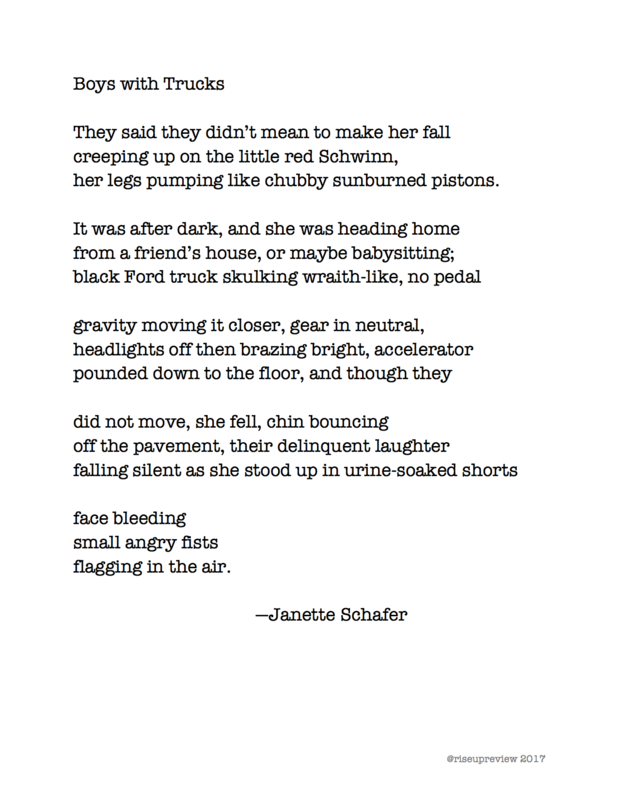 Janette Schafer is a poet, playwright, and opera singer living in Pittsburgh, Pennsylvania. She is a 2017 Maenad Fellowship winner in creative writing through Chatham University. She was a 2015 Arts MODE Fellowship awardee in playwriting through New Sun Rising LLC, the resulting theatrical work "northeastsouthwest" winning the 2016 Pittsburgh Fringe Festival. Upcoming and recent publications include: VerseWrights, Eyedrum Periodically, The Woman Inc., Zany Zygote Review, and Chatham University broadsides.